4.17.18 Brett Carver has spent more than 30 years breeding wheat at Oklahoma State University which gives him a unique perspective on the Great Plains mindset about releasing quality cultivars. Join Scott Yates, director of communications and producer relations at the Washington Grain Commission, as Carver talks about quality in a region of the country where yield is king in episode 69 entitled: Oklahoma! Where Brett Carver Comes Breeding on the Plains. 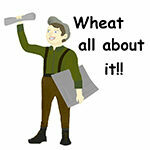 Access the Wheat All About It! podcast at the WGC website at wagrains.org or subscribe on iTunes, Overcast or Pocket Cast. Connect by Wifi or a four bar cellular link for quick downloads which can be listened to later in the tractor, truck or easy chair.